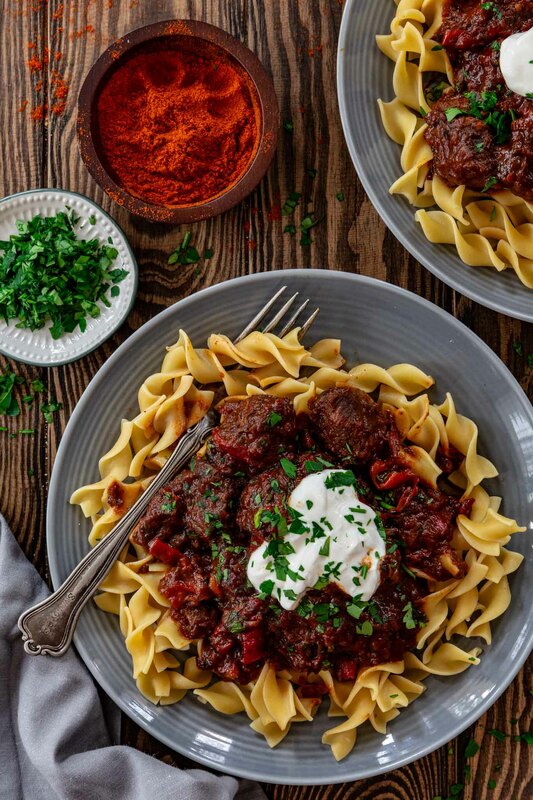 Known across the United States as Goulash, Pörkölt is a Hungarian Beef and Onion Stew seasoned generously with paprika. Tender beef that melts in your mouth in a deep and rich sauce, this is the perfect project for a chilly weekend! As soon as I heard we were getting a snow storm, I ran to the grocery store to buy the ingredients to make Pörkölt. I usually don’t need an excuse to crave beef stew, but cold weather simply asks for it! There truly isn’t anything as comforting as sitting by the fire with a bowl of stew. 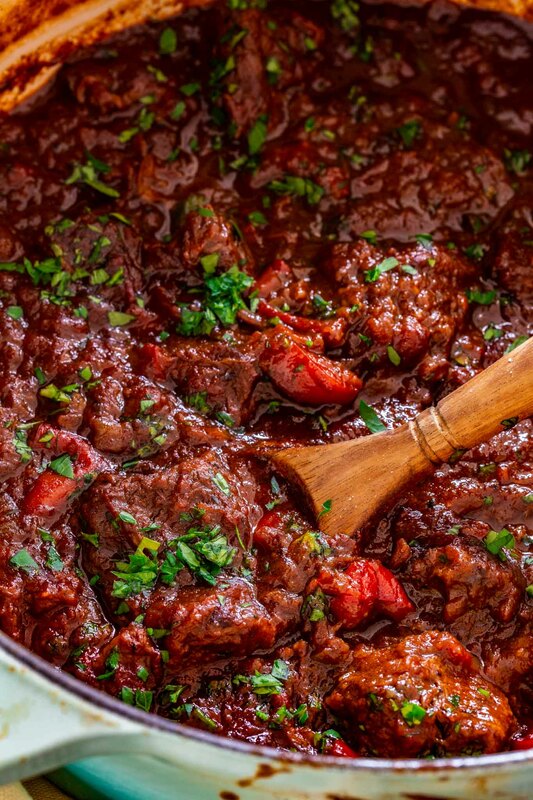 As it’s the case with most stews, Pörkölt is a simple dish, delicious not because of its complexity in cooking, but for the amazing rich flavors – coming predominantly from the smoky earthiness of the paprika – and the tenderness from the slow cooked beef. It tastes even better on the second day, when the flavors have had time to mingle, and it also freezes well. In fact, I highly recommend you make a batch just to freeze, so you can have it on hand whenever snow strikes and you need something cozy and hearty that is guaranteed to hit the spot! The first time I had this dish, it was served to me under the name “Goulash”. By the time I had cooked it a few times and decided it was time to share it on the blog, my research taught me that what I (and the rest of America) was cooking was actually named “Pörkölt”. While both dishes are delicious and similar in the sense of using beef and a generous amount of paprika, they are definitely not the same. Goulash (gulyás) is actually a brothy soup, not a stew, made exclusively from beef and often including vegetables like potatoes and carrots. Pörkölt, on the other hand, is a rich stew that can be made with different kinds of meat. And, if you add sour cream to Pörkölt, it is called Paprikás. I have never been to Hungary and I generally try not to claim authenticity in my non-Brazilian recipes. 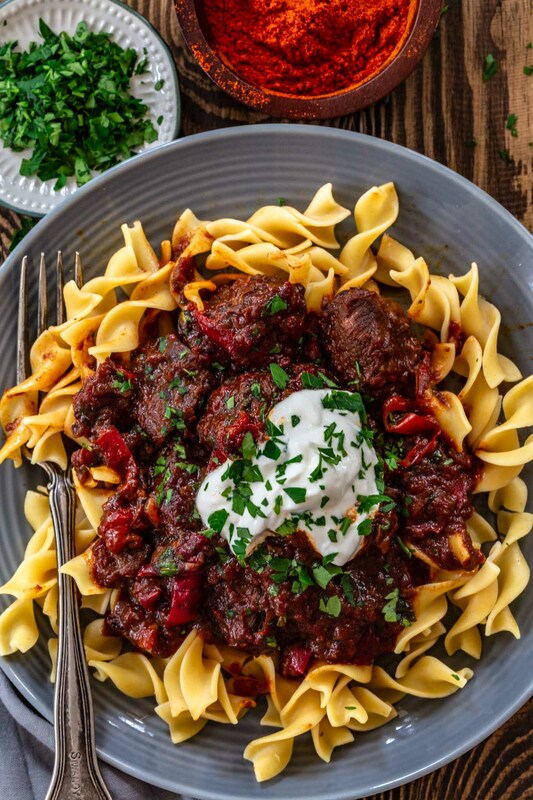 That being said, I decided to name this recipe its proper name – even though I know everybody knows it as goulash – as a form of respect for the Hungarian culture! There are as many ways to make Pörkölt as there as families in Hungary! Long, slow cooking is the key, though. If you want to get technical, the technique we use for this dish is “braising” and not “stewing”, as you are not supposed to submerge the beef completely, only partially. Remember, Pörkölt is rich and thick, not brothy like Goulash! Purists will say that you should never add flour to thicken Pörkölt. They also say that wine, tomatoes or tomato paste are a no-no and that you should get your bright red color from the paprika alone. Well, call me a heathen and my recipe inauthentic, because I really think it benefits from all these things. I also add brown sugar, since I think a little sweetness balances out the earthiness from the paprika. 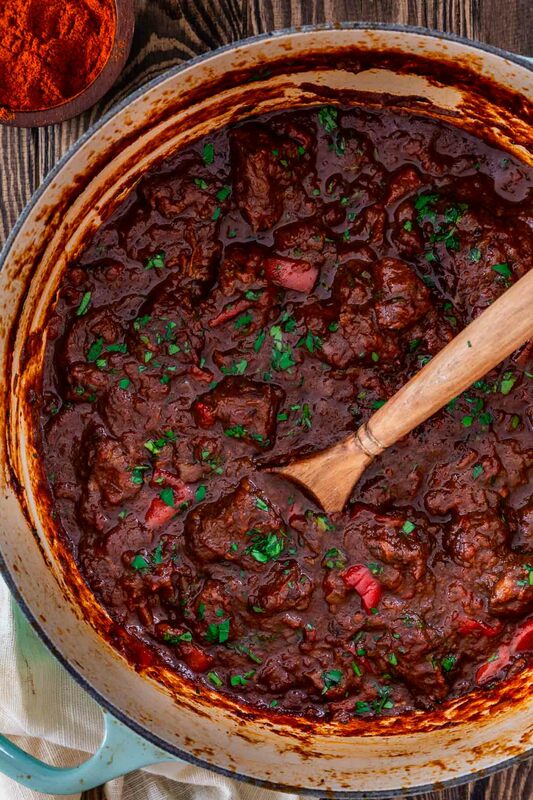 I do love a slightly sweet stew, like Carbonnade Flamande, but it’s okay if you don’t. Just omit the sugar and you should be good! As for the paprika, it has to be Hungarian and fresh. I’ve seen it widely available (in that pretty red box) at most supermarkets, but if you can’t find it, Amazon will deliver to you. I use a blend of hot and sweet, but you can customize it according to your preferences. Tough cuts are always the way to go when making beef stew! You might be tempted to splurge in those expensive ribeyes or tenderloins. After all, you want your beef to be falling apart tender and it’s obvious that those would produce the best results, right? Wrong! Tender cuts actually get tough and dry when cooked too long. What you want are cuts that are rich in collagen from connective tissues, as that breaks down over long cooking and transforms into soft gelatin, giving you that melt-in-your-mouth texture that you are looking for! My personal favorite cut for stews is boneless chuck roast! Not only it’s always available and affordable, but it is flavorful and full of connective tissues and fat. I would avoid the pre-packaged “stew meat”, even if it says chuck, because they are likely a mixture of cuts that will cook at different rates. If you want to learn more about these cuts and the more scientific details on collagen and connective tissues, check out this article from Serious Eats. Kenji is a great food scientist and I love reading about his discoveries! I also use his technique of cutting the chuck roast into 2-3 steaks and searing them like that before cubing. That way, the meat browns properly, giving us that deep caramelization that we want in the stew, but stays juicy and tender. 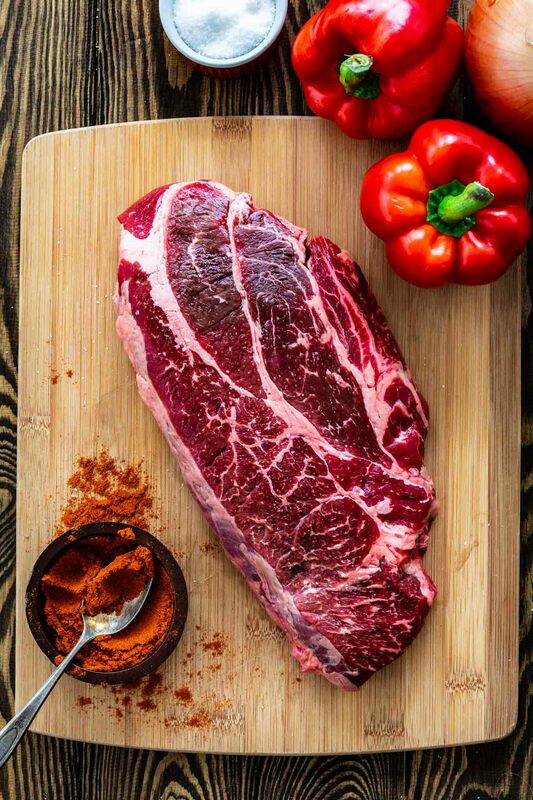 Paprika is one of the most common spices in America and it is the fourth most consumed spice in the world. It is a powder made from dried and finely ground Capsicum annuum peppers, used in recipes for both flavor and color. Sweet – has almost no heat at all, just a sweet peppery flavor. The kind you should use if a recipe doesn’t specify which kind. Hot – has a significant kick, but still not as spicy as cayenne or red pepper flakes. Use it in any dishes that would benefit from its warm fiery flavor! 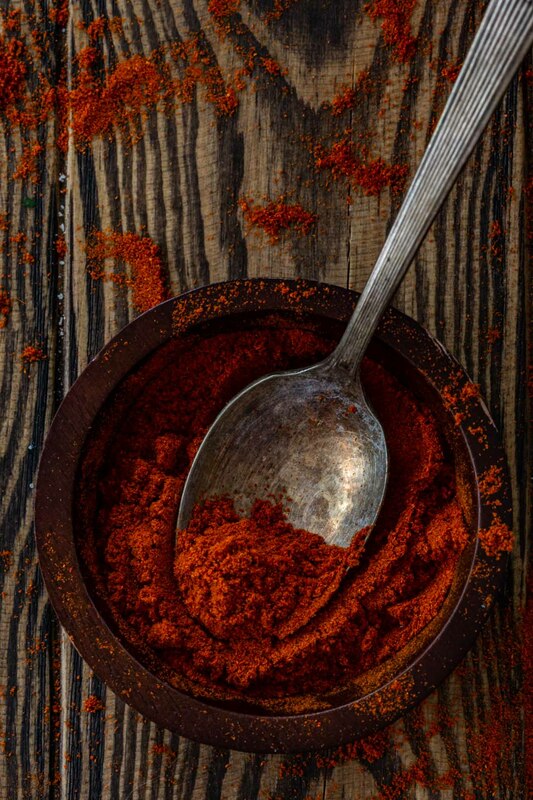 Smoked – also called pimenton or smoked Spanish paprika, it has a rich, smoky flavor and is generally less intense than Hungarian paprika. It’s made from peppers that are smoked over oak fires before being dried and ground into powder. You can find it in mild (dulce), medium (agridulce) or hot (picante) varieties. Used for paella and other Spanish dishes as well as chicken kebabs and some rubs. If you visit Hungary or is lucky enough to have access to imported paprika, you will be able to choose from an even greater variety. There are eight grades of Hungarian paprika: különleges (“special quality”, mild and most vibrant red), csípősmentes csemege (delicate and mild), csemege paprika (still mild but more pungent), csípős csemege (even more pungent), édesnemes (“noble sweet”, slightly pungent and bright red), félédes (semi-sweet with medium pungency), rózsa (mildly pungent and pale red), and erős (hottest and light brown to orange). 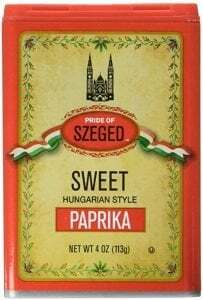 The Hungarian sweet paprika that we find in the US is usually the édesnemes variety. With all these interesting options, why settle for the basic unspecified paprika that you find in the grocery store? It is the least assertive in flavor, offering a low-intensity pepper flavor without much heat or sweetness. Use it only if you’re after color but not flavor. Whichever paprika you choose, make sure you’re buying it as fresh as you can and then store it in a cool, dark place for up to six months. Paprika’s flavor dissipates quickly and when it gets stale it can taste like chalk. As for cooking with it, one thing to keep in mind is that paprika burns quickly and turns bitter. I wouldn’t let it spend more than a few seconds in hot oil before adding liquid. I like serving this stew with spätzle or egg noodles, but it would also go great with rice or mashed potatoes. Anything starchy to soak up all that yummy rich sauce! A sprinkle of parsley brings freshness to the dish and a dollop of sour cream creates a great contrast between cool tanginess and deep spiciness. Not to mention making it very creamy and indulgent! As I mentioned earlier, if you add sour cream to Pörkölt, you should technically call it Paprikash. But I don’t think I’ve ever seen Pörkölt served without the option of sour cream. Called whatever you’d like – Paprikash, Goulash or Pörkölt – but make this! It’s a warm and inviting dish that will help you beat the cold weather blues! 2.5 pounds chuck roast, cut into 3-4 steaks. Season the steaks generously with salt and pepper. 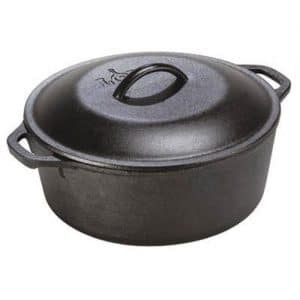 Heat oil in a large Dutch oven pot, over medium-high heat, until shimmering. Add the steaks and brown for 4-5 minutes per side. Remove and reserve. Lower the heat to medium. Add butter to the pot and, once melted, add the sliced onions. Cook, resisting the urge to stir too much so they can brown, until they are softened and lightly browned/caramelized, about 8-10 minutes. Add the garlic and red pepper and cook for another 3-4 minutes until softened and fragrant. Cut the seared steaks into 1 1/2 to 2-inch cubes and transfer to a bowl. Toss with flour. Add the beef back to the pot, stirring to combine. Add the red wine and cook until reduced. Then, add the beef broth, paprika, brown sugar, bay leaves, tomato paste and crushed tomatoes. Reduce the heat to a simmer and cook, covered, for 2 1/2 - 3 hours or until the beef is tender and the sauce is reduced. Taste for seasoning and add salt and pepper, as needed. Sprinkle the chopped parsley and serve over egg noodles and with a dollop of sour cream.